Lapeer County Lapeer Mental Health (CMH) is now offering the Mental Health First Aid program in Lapeer County. CMH will train police officers, first responders, nurses, counselors, school personnel, bus drivers, social service workers, pastors, and members of the general public including small business owners, for a total of 4 % of our population. The goal is to improve mental health literacy – helping them identify, understand and respond to signs of mental illness. “We are thrilled to bring Mental Health First Aid to our community,” said Dr. Robert Sprague, CEO of Lapeer County Community Mental Health. “This important educational effort goes a lot further than emergency help; it really helps people understand the cloud of fear and misjudgment facing individuals and families who experience mental illnesses and addiction. It will help rid this community of the associated stigma and move more and more people toward recovery.” With one in four people experiencing a mental illness in any given year, the chances are high that individuals will witness a mental health emergency, perhaps with a family member, friend , or co-worker and will be able to use their skills learned in Mental Health First Aid training to help. “With the inclusion of suicidal risk evaluation and intervention included in the 8 hour training, they may even save a life.” states Melody Munro-Wolfe, LMSW, Chairperson for Lapeer County Suicide Prevention Coalition. Mental Health First Aid is a 8-hour training certification course which teaches participants a five-step action plan to assess a situation, choose a means of helping and locate appropriate care for the individual. The certification program introduces participants to risk factors and warning signs of mental health problems, builds understanding of their impact and overviews common treatments. Research studies have proved the CPR-like program is effective in improving trainees’ knowledge of mental disorders, reducing stigma and increasing the amount of help provided to others. In its pilot year, the program was introduced in nearly twenty states and more than 40 communities nationwide. The National Council certified Susan Clement, LPC of Lapeer County Community Mental Health to provide the Mental Health First Aid program beginning in September of 2013 through an instructor certification course in Boston, Massachusetts. The thumb Alliance PIHP sponsored the training for Sue through a grant and has plans to send three more people from Lapeer County to become certified trainers to New Orleans in mid – March including two staff social workers and one Deputy from Lapeer County Sheriff’s Department. Lapeer CMH and all the sites across the nation that replicate this program maintain strict fidelity to the original, proven program. Mental Health First Aid originated in 2001 in Australia under the direction of founders Betty Kitchener and Tony Jorm. To date, it has been replicated in twenty other countries worldwide, including Hong Kong, Scotland, England, Canada, Finland, and Singapore. For more information or to participate in Mental Health First Aid training in Lapeer County, call Lapeer County Community Mental Health at 810-667-0500 and ask for Susan Clement, LPC. A training class can be arranged for your office or group, when it is convenient for you. Churches throughout our county provide various forms of care and support for individuals who are struggling with a host of different challenges. 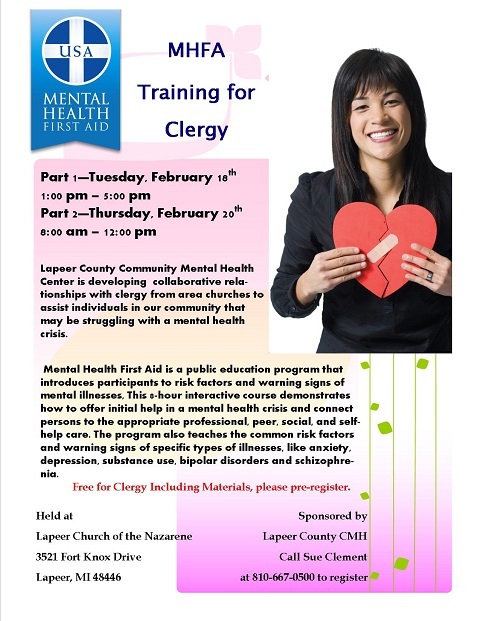 Lapeer County Community Mental Health has begun an initiative to train individuals in our community in Mental Health First Aid. Just as CPR/First Aid training teaches individuals how to respond in a medical crisis, Mental Health First Aid offers training for first responders in a mental health crisis. Lapeer County CMH would like to utilize some of our grant funding to train members of the Faith community at no charge. Included with this letter is a flyer explaining more about Mental Health First Aid. If you are interested in attending this two part training or if you have any questions, please feel free to contact me at 810-245-8529. I look forward to meeting you and to developing an alliance between our agency and your church community. I believe together we can best be of service to the people in our community. The National Council for Behavioral Health is a not-for-profit, 501(c)(3) association of 2,000+ behavioral healthcare organizations that provide treatment and rehabilitation for mental illnesses and addictions disorders to nearly seven million adults, children and families in communities across the country. The National Council and its members bear testimony to the fact that medical, social, psychological and rehabilitation services offered in community settings help people with mental illnesses and addiction disorders recover and lead productive lives. To provide and ensure twenty-four hour exemplary Public Safety Communications service for the citizens, communities, and public safety responders of Lapeer County.